Hercules DJ Black Edition Quiz Contest on Facebook! They have already been contacted by email and will receive their prize soon! Stay tuned on www.facebook.com/herculesdjmixroom for the next contests! 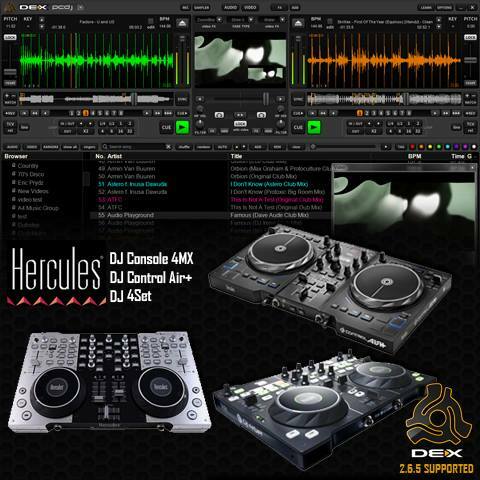 Hercules unveils DJ Console 4-Mx Black Edition! At NAMM Show 2013, Hercules unveiled the Black Edition of its well-known DJConsole 4-Mx, the professional controller of its range. Hercules looks forward to seeing you at the NAMM Show in Anaheim, California, from January 24 – 27, 2013. London, January 22, 2013 – Hercules invites you to drop by booth #6698, Hall A, and immerse yourself in its world of DJing. In keeping with its philosophy of making DJing accessible to everyone, Hercules will be giving visitors a chance to live the experience made possible by its latest controller, the DJConsole RMX 2. The first controller in its category to feature a high-resolution 96 kHz/24-bit audio interface in Windows® (ASIO) and on Mac® (Core Audio), Hercules DJConsole RMX 2 is the “pro” DJing solution that combines performance, versatility and mobility – all at an affordable price point. At NAMM, Hercules will unveil the Black edition of its well-known DJConsole 4-Mx, the professional controller of its range. Also available for testing at the booth will be the full range of Hercules DJ headphones, monitoring speakers, and the limited editions of the DJControl Instinct and DJ Control AIR: the Street Editions. Karla Kenya – DJ at NRJ Radio in Berlin, and winner of the German edition of EMI’s “She Can DJ” competition. Be sure to pay us a visit and check out their performances!